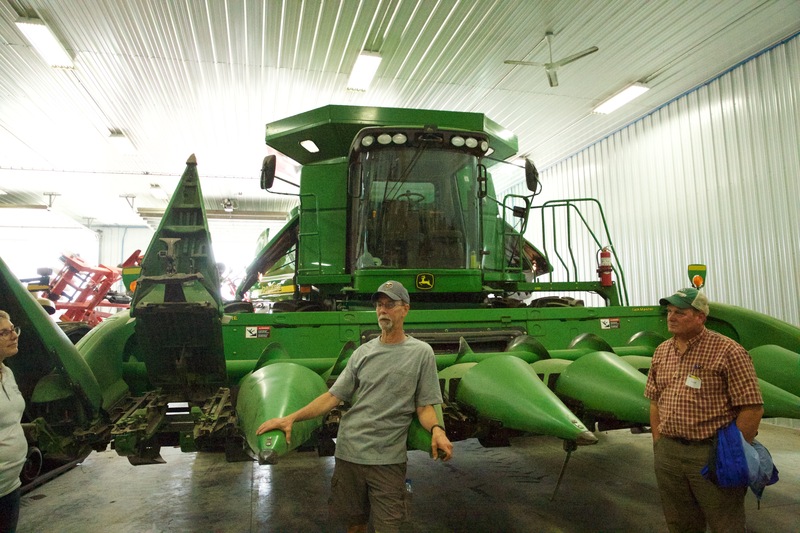 A soil tour of Nicollet County uncovers some of our soil’s mysteries and potential, and its devoted farm and conservation protectors. Out on the Peters Family Farm in Nicollet County, attendees of the Nobel 54 Sneak Peak Soil Tour learn and explore the land we sit on. What kind of soils do we have here? “Good black dirt,” said Nick Peters, an alum whose family has been farming outside of Saint Peter since 1864. It was the classic, understated Minnesota farmer response. But then Peters launched into a detailed discussion of ph balance and peat, of hidden lake beds and microbiomes, and geologic history. Apparently, there’s a lot that goes into that good black dirt. 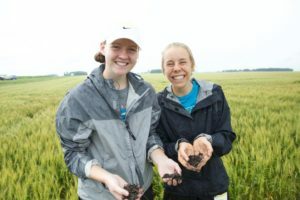 In a sneak peak of this year’s upcoming Nobel Conference (Living Soil: A Universe Underfoot), more than 50 folks of a variety of ages spent a day discovering and exploring the soils of Nicollet County. They ranged from retired lifelong learners to “geology nerds” to curious alums to student environmentalists to high schoolers from the Gustavus Faith, Science, and Ethics Academy. The group was led by specialists in soil, water quality, conservation, and geology. Among the crew were several area farmers. The day was co-sponsored by Great River Greening. An introduction to that “good black dirt” was first delivered by Peters, out on his family farm. It was augmented by a USDA soil scientist and a watershed technician. The group learned about cover crops, crop rotation, and different tilling options. 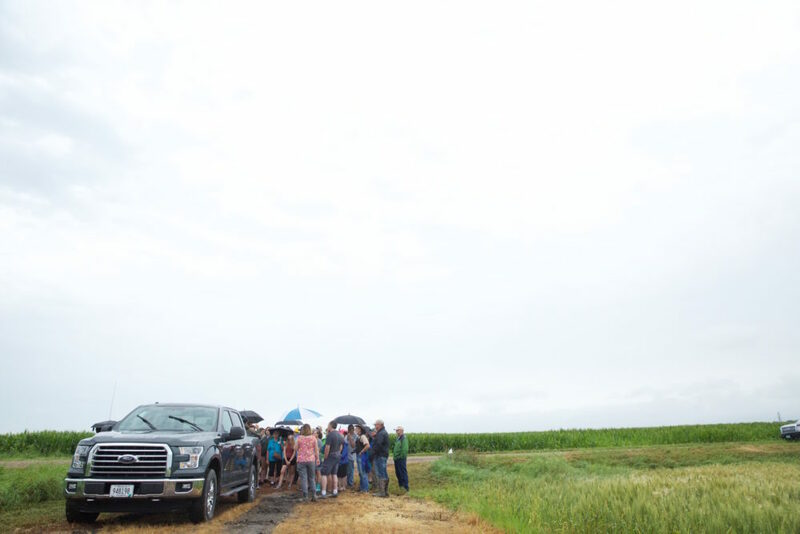 On another nearby farm, a water quality specialist showed how advancements in farm tiling systems can help control soil erosion, and Gustavus professor Laura Triplett showcased some of the geologic history underneath the soils of Nicollet County. At Seven Mile Creek County Park, where Triplett and her Gustavus students have been conducting research for years, the group heard from Triplett about soil erosion at the park, where the hardwoods are beautiful but not native and the streams are “flashy” (prone to flooding during rain). The group also heard from Susie Carlin of Great River Greening on conservation efforts around the Seven Mile Creek watershed, and the many ways in southern Minnesota that conservationists, farmers, and citizens are working together to improve water and soil quality. 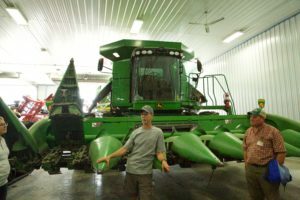 Later, out at the farm of Doug Wenner and Jeff Leonard, the group learned about technological advances that have increased efficiency in farming and reduced the use of fertilizers and pest control. Jennifer Han, a precision agriculture and conservation specialist with Pheasants Forever, discussed how today’s farmers can customize adjustments to soil, seed, fertilizer, and pest control in as little as a 10’ x 10’ foot area of field. This year’s Nobel Conference, Living Soil: A Universe Underfoot, is October 2 and 3. Tickets are available now. Buy one ticket, get one free using the discount code SOIL.